Your Daily Dose of Motivation | Choose Your Energy: Change Your Life! When was the last time you took a shower? We don’t tend to think that the benefits of one shower will last a month or a lifetime. But we do tend to think that way when it comes to motivation. 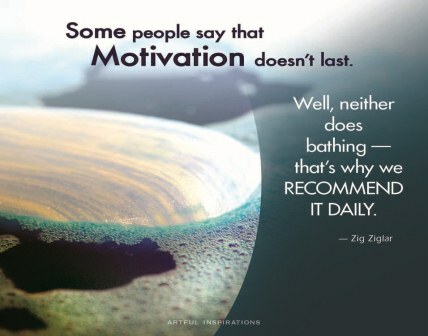 Like a nice hot shower, motivation invigorates and inspires. But it’s not something you do once and then you’re done. You don’t ‘get’ motivated and ‘stay’ motivated. For many, intentional self-motivation isn’t a regular aspect of life. It’s a book we keep on our shelf that we pull out from time to time, a quote we read once in a blue moon or a mantra that we tried for an hour, a day or a week and then abandoned. When our productivity or enthusiasm start to wane, or we become royally stressed, we may try getting motivated once again but once the pressure is off, we drift back into our old, less supportive way of living. What if motivation was built into your daily routine? How would your life change? How would it affect your energy, enthusiasm and ability to celebrate your milestones or press on when things get tough? When you stop treating self-inspiration as an event and start embracing it as process, a way of being, you’ll find you live in a more centered state of generous, effortless, gracious flow at all times. When you mindfully fuel your core energy with love, respect, curiosity, compassion and gratitude, you will have access to the faith, hope, prosperity, peace and joy you seek in each moment. It could be as simple as always waking up to your favorite song. Or taking a few minutes each morning to read an inspiring book. Maybe it’s a few pages of daily journaling or EFT tapping on your dreams and challenges. Or going for a daily run. Or meditating in the park at dawn or dusk. Or practicing intentional gratitude—naming five things you are thankful for—at the opening and closing of each day. Whatever form it takes, making motivation and inspiration daily priorities will work wonders in your life. Invest in yourself—you’re worth the effort! This entry was posted in All My Blog Posts, Faith, Hope & Spirituality, Gratitude, Prosperity & Abundance, Joy & Vitality, Mindfulness, Meditation & Peace and tagged Deborah Jane Wells, What is abundance, What is faith, What is gratitude, What is hope, What is joy, What is mindfulness, What is peace, What is prosperity, What is spirituality, What is vitality. Bookmark the permalink.